It is summer; the sun is magnificently shining, and the inside of your home feels like a blast furnace. It’s profoundly probable that you aren’t going to turn the oven on and so the only choice is to cook some delicious dish outdoors. Grilled fish or chicken, or perhaps something that you’ve always wanted to try, but you couldn’t? They say barbecuing, or grilling is a form of art and perfection comes with how much experience in handling the grill and using the sauces one has. 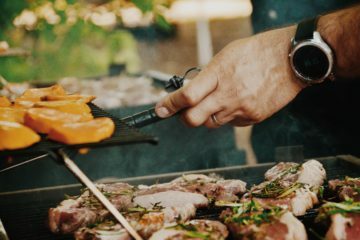 It can take many a fish fillet to finally figure out what combinations of spices, grill’s temperature and exact time for you to finally hold the ‘Barbecue Guru’ tag. But regardless of the total number of trial and error episodes, you have been through, don’t ever get discouraged. 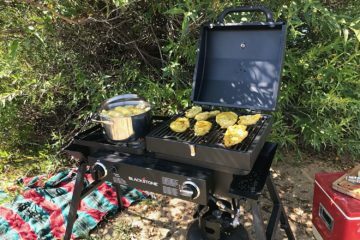 So, if you are contemplating on firing up that temporary backyard kitchen with your secret grilled delicacy, why not try something worthwhile? From appetizers to salad; from the tantalizing to the downright bizarre and everything in between, here’s what you may probably give a shot. 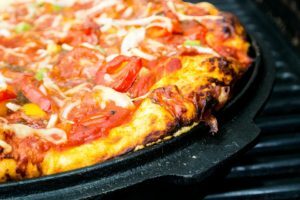 Pizza grilling isn’t the latest fad in town, but it can be a wholly new adventure if you are a foodie. Pizza Grill will particularly suit you if you always delight in blackened char pieces of meat. Grilling starts when the dough is placed on a hot grate. Preparation is pretty simple as you only need your favorite homemade pizza dough (store-bought can do an excellent job too). Pound the dough as you stretch it until it is perfect with the thickness of just about an inch. Assuming the coal is hot and ready, place it on top of the grill and cook. Now; if having a soft, crusty pizza is your thing, then cook one side of it. However, if you love it crusty and chewy then grill both sides. Add your favorite topping on the uncooked or undercooked part and place it on the grill to melt. If you are smart enough, then save yourself the hassle of sitting and waiting for the cheese to melt – precook the other toppings and just add them once the pie is ready. 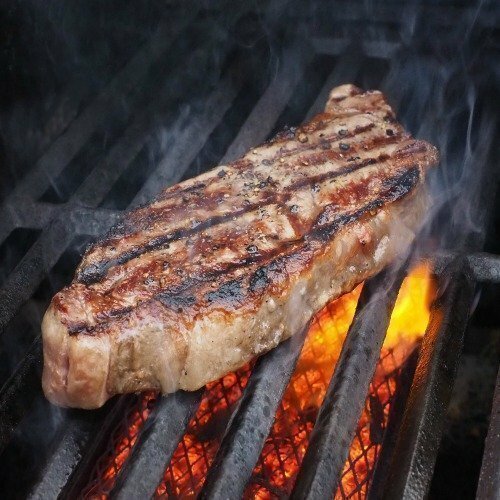 if you expect to actually enjoy your Vegan Steaks, do ensure that it has a unique meaty texture and aroma. There are several recipes to try, but many are quite complicated. 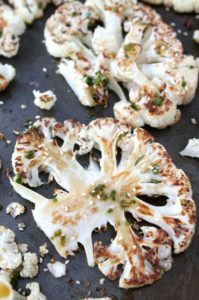 Cut a fresh cauliflower into small and thick slices before dousing them with a smokey blend made up of chipotle chili powder, lime zest, and some paprika. Place the entire mix of Caulisteaks in a hot grate to cook. Once they are evenly cooked, saturate (or marinate) with some honey, garlic and olive oil until they are browned. Your final touches must include mixing the Caulisteaks with some chopped cilantro and fresh lime juice. You may also use homemade seasoning marinade made up of coconut sugar, tamari, ginger, cinnamon, chili, and coriander. The grilled steaks can be served over a bed of rice. If veggie steaks aren’t part of your plans, then please try some Tofu because it can be tastier than a grilled vegan patty. Tofu, in the first place, can be an entree-worthy backyard treat this summer – that is if everything is done systematically. Yes! It should be among the highly revered delicacies such as steak, ribs, chopsticks, grilled fish and the likes. 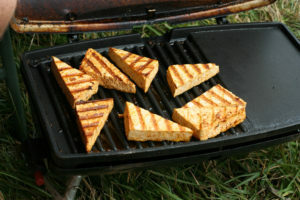 So, to prepare an incredibly Grilled Tofu, quickly start by preparing the non-silken Tofu. Carefully unpack your tofu and dry it well. As it hardens, think of how you will give it a flavor – heavy seasoning and marination will work out well. If you skip the all-important step of marinating the delicacy, trust me, the whole dish will taste bad. Now, give the hardened piece of tofu a befitting flavor by soaking it in barbecue sauce, Italian dressing, jerk seasoning and any other blend that delights. Remember to go overboard and use as many of the sauces as possible. Once you are confident that you did a really good marination, cook the pieces under low, indirect heat. Flip momentarily for the precious grille marks. Serve with the sauce again and enjoy. No need of the oven when the Grill can do a perfect job. But first, for an ultimate savory taste, create a veggie filling before lighting up the grill. You should use any homemade kale pesto recipe that includes vegetables and cheese. And if you are a pescetarian, then Grilled Vegetable Quesadillas with Kale Pesto will taste remarkably enjoyable with grilled shrimp. Who else can’t wait to taste some crusty grilled salad? Turns out, meatballs, chopsticks, chicken, and salmon aren’t the only mouthwatering delicacies. When left intact, leafy vegetables can prepare a genuinely delicious dish, especially because of a little a smoky char that goes well with creamy sauces and flavorful vinaigrettes. 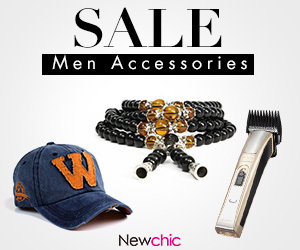 Lots of them can make you salivate – just like the sight of a well-cooked chicken breast often does. You should try some grilled kale salad with ricotta and plums or just grilled romaine with red pepper. 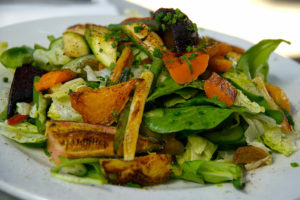 Others include roasted sweet potato with scallion salad and grilled pineapple with cucumber salad. Not all fresh fruits leave a pleasant aftertaste, and it’s pretty reasonable to avoid eating them. However, instead of ditching that one or more varieties that don’t taste good, why don’t you grille it instead? Grilling fruits isn’t about slicing them into smaller portions before spreading over a hot grate. If you love meatballs, then try to create chop-like fruits. Again, regardless of the fruit, you will be grilling, just make sure that it is well doused with olive oil. 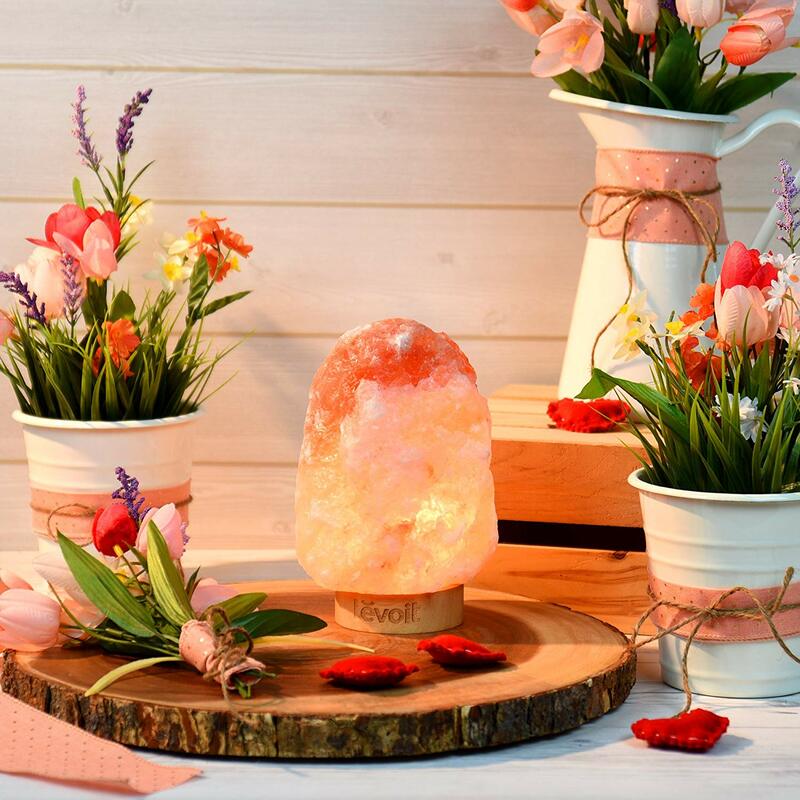 Indirect heating is mostly recommended because it doesn’t get to denature and damage the living organisms and chemical compounds like vitamins. 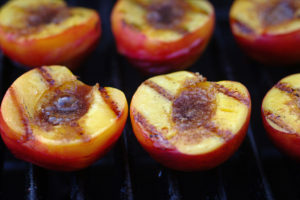 The best vitamins to grill comprise plums, peaches, pineapples, watermelons, strawberries and other juicy varieties. For someone who needs to try and grill something that tastes exactly as yummy as it looks then Apricot Glazed BBQ Chicken Thighs will not upset. The entire preparation process is simple and straightforward. You just season the thighs with salt and paper and let it rest. Then, you mix all the other ingredients – olive oil, apricot preserves, a little balsamic vinegar, minced garlic, and mustard, in a small bowl. As the grill heats up, sauté the chicken over medium heat while repeatedly flipping it. Grilling can take 8-10 minutes before you marinate it with your dry sauce. In this list and perhaps any other list of tantalizing grilled treats made using a Barbecue Grill, Grilled Lamb Meatballs with Salsa Verde is arguably the easiest to prepare. The fancy looking meatballs take as much as ten minutes to be ready. Cooking fundamentally involve rolling grilled meatballs and dipping them on skewers. Salsa Verde is a herbal sauce responsible for the food’s zesty flavor. Perhaps you know that the simplest way of tenderizing meat before it is barbecued is to flatten using a hammer. So, after hitting 4-8 small pieces of pork, soak them in a saucy mixture for an hour or so. It should be done the elaborate way so that the dish absorbs all the flavors ahead of grilling. Wipe off the saucy marinade, season with salt and grill over low, indirect heat for a few minutes. 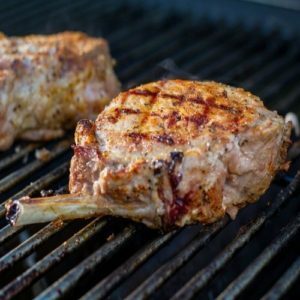 You will wait until the chops are clear colored or slightly pink before seasoning with a special sauce again and serving. Your second sauce will comprise egg yolk, capers, cornichons, chives and olive oil, all mixed. Let’s face it; cooking bacon indoors is glamorous until the greasy fats mess up the whole place. However, cooking outside is beneficial because besides being able to grill tasty bacon, no much cleanup would be needed. You just cook the bacon for 5-6 minutes, stick it on a burger and enjoy with a salad. 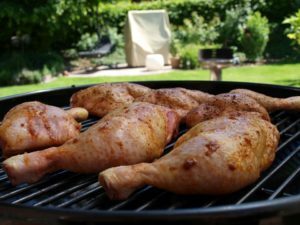 Being a barbecue guru is often associated with having extensive knowledge and experience in grilling various meat foods, including chickens and fishes. 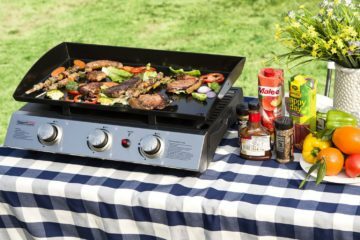 However, as it has been revealed by this post, it is very much clear that even vegans can enjoy the best of grilled delicacies without having to taste some meat. 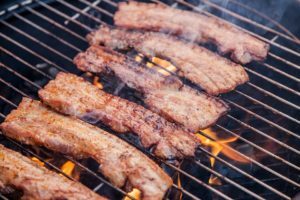 Almost all grilled vegan diets, as explained by this article, involve many of the organic, readily available ingredients. Again, most of these amazing cuisines aren’t just tasty and tantalizing only; they are healthy and economical. Their preparation also requires no special culinary expertise, which inherently means that anybody can prepare them this summer. So, if you would love to make your passion for grilling truly extraordinary and perhaps earn the elusive “grilling champion” tag-line, master the correct way of preparing these foods.